It seems like Fall is getting shorter and shorter every year, so take advantage of the weather while you can and get a few items checked off your Winter prep list. Making sure your home and yard are properly prepared for cold temperatures will give you peace of mind later. Make this year the one where you start a compost bin. They are easy to build and you will reap lots of rewards from the black gold it generates. If you want to learn more about composting, check out our blog, 10 Good Sense Tips for Building a Compost Bin, and find out how it can help your garden and the environment. Cold weather likes to remind us of the little things we forget to address before the needle drops – like water spigots and hot tubs. List all the small stuff outside that needs to be readied before Old Man Winter arrives – and get ‘re done. We’ve listed a few items to get you started. Avoid the problems cold temperatures bring by preparing for harsh Winter weather now. A list of DIY projects to do this Fall is an easy way to make sure things get accomplished. By winterizing your garden and the outside of your home, you are protecting them and saving yourself from costly repairs. It’s a win-win for a DIYer like you. From rakes and ladders to pressure washers and tillers, our expert staff is always on hand to help you get ready for the cold weather. Not sure what else you need to do to close out your garden? Our blog, Fall Checklist Pt. 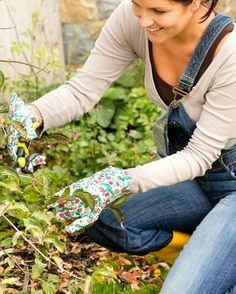 1: Garden Clean Up – Winterization, has tips on making sure your perennials survive until Spring. As always, if you have any questions about pricing or how-to’s, don’t hesitate to contact us. Stop by our store — we’re open seven days a week. In the coming weeks, your kitchen is going to get a real workout. Before your holiday cooking marathon begins, take time to give it a thorough cleaning so you can focus on what’s important – family and friends. First thing on the agenda is cleaning out the refrigerator. Make room for your holiday dishes by purging expired containers and leftovers. Wipe the shelves with soapy water and add a new box of baking soda. Clean the condenser coils on the back of the refrigerator to help it run more efficiently. First, turn the power off before pulling it out (be careful not to disconnect the water line from the ice maker). Vacuum the dust off the coils, then slide it back and turn the power back on. Wipe down the front, sides and top of your refrigerator to finish. You are about to use your oven non-stop. 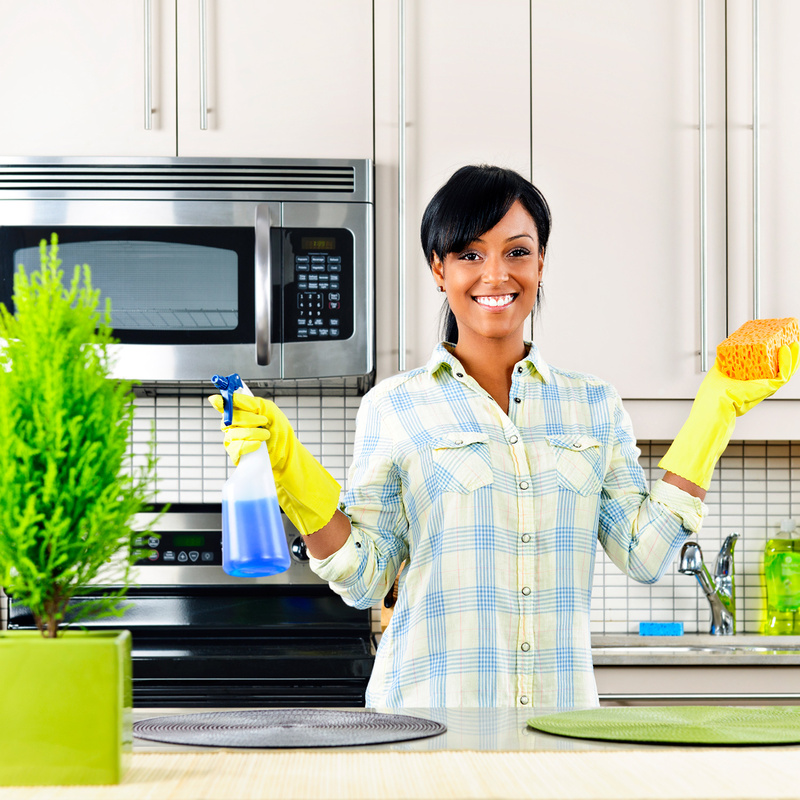 Starting with a clean one will make final clean-up easier – plus it will likely run more efficiently, too. Clean the inside of the oven by using the self-cleaning feature or by using a little elbow grease. Wipe down the wire racks as well as the outside. Depending on the kind of stovetop you have, clean out the burners or polish the cooking surface. Donate mismatched dishes and glassware – A beautifully set table will impress your guests. Get rid of old appliances – If your toaster oven has seen better days, now is the time get a new one. Dust ceiling fans and light fixtures – Clean the ceiling fan blades by using an old pillow case. Put the blade inside the case to catch the dirt. Use a ladder when vacuuming light fixtures. Clean the microwave – Put a bowl of water with lemon slices inside to heat for 3 minutes. The steam will loosen food particles and the lemons get rid of odors. Restock the pantry – Don’t wait until you start cooking to find you are missing something. Take an inventory to see what you need. Replace anything that looks old or has an expired freshness date. Sharpen your knives – Have a professional do this or purchase a whetstone and learn how. Round up serving utensils – Do you have what you need? Purchase any ladles, slotted spoons, tongs or cake servers you might need. Don’t forget a wine opener. Check the fire extinguisher – Accidents do happen so be prepared. Make sure you have a first aid kit handy. Are your smoke and CO2 detectors working properly? Polish the silver – If you are planning to use Grandma’s silverware, wash and polish the pieces ahead of time. 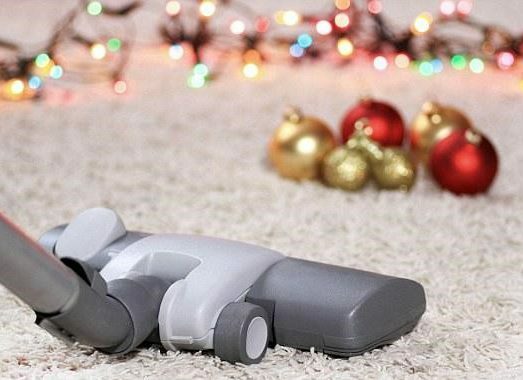 Childproof your home – Are you expecting small children to be at your house over the holidays? Look for any potential trouble spots in the kitchen and your home. Safety plugs and bumpers for sharp corners are always helpful. Clean trash cans – A big dinner creates a lot of garbage so disinfect your cans ahead of time and have a stash of extra bags ready for the event. There is no good time to discover that the dishwasher leaks but with a little preventative maintenance you can keep your holidays dry. Check the drain for any food that might clog it. Clean the door gasket and check to see if the seals have deteriorated. Fill the detergent cup with white vinegar and run a cycle to clean the inside. Giving your kitchen a massive cleaning before the holidays might seem counterproductive since it is going to get messed up anyway. There is a method to our madness. Going into this busy time with a bright and shiny work space allows you to focus on your recipes and your company. A spotless, fully stocked kitchen is less stressful for you and makes cleaning up after guests leave a lot easier. So, scrub now, relax later. Happy Holidays! From ladders and vacuums to banquet tables and folding chairs, our expert staff is always on hand to help with your holiday preparations. Worried about how to put your house back together after everyone leaves? Our blog, Turn Post Holiday Clean-up into a Fresh Start for Your Home, is the perfect game plan for the New Year. As always, if you have any questions about pricing or how-to’s, don’t hesitate to contact us. Stop by our store — we’re open seven days a week. The Versatile Wooden Pallet – Who Knew You Could Make That?! Ah, the versatile wooden pallet! If you love to re-purpose found items, then you know about these multi-talented platforms. The internet is filled with how-tos on making everything from lawn furniture to dog houses. However, our favorite project is a wine rack with a glass holder on the bottom. It has our DIY name written all over it! Why buy lumber for your projects when you can repurpose wooden pallets? If you don’t have them on hand, check with your local stores. These shipping platforms are everywhere; you just have to look for them. 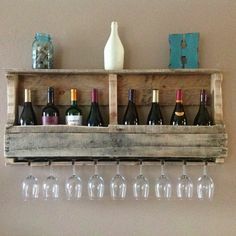 Creating a wine rack out of a wooden pallet is easy and inexpensive. The toughest decision is what size to make it. For a small rack that will hold two to three bottles and four average sized stemmed wine glasses, you will only need to use half of a pallet. Cut the pallet – Use the end section for the base and cut it to the height you want. The standard width of a pallet is 40 inches so adjust it to the width you need. Remove extra boards – Take two boards from the discarded portion of the pallet to use at the bottom of the rack. One board will be the bottom of the shelf where the bottles go and the other will separate the shelves. Create spacers – Cut three 1 x 1 pieces to go between the bottom board for the glasses and the bottom of the wine bottle shelf. You need room to slide the glasses on and off the shelf. Sand the boards – Pallet wood is notoriously rough and splintered, so use a 120 grit sandpaper for smoothing and a 220 grit paper to finish. Openings for glasses – Use a jigsaw to make cuts in the bottom board for the glassware stems. Space them about 4 inches apart. Assemble – Make sure your rack is sturdy by reinforcing the wine bottle shelf with an extra board. Use 2-inch nails and 3-inch wood screws to hold the board together. 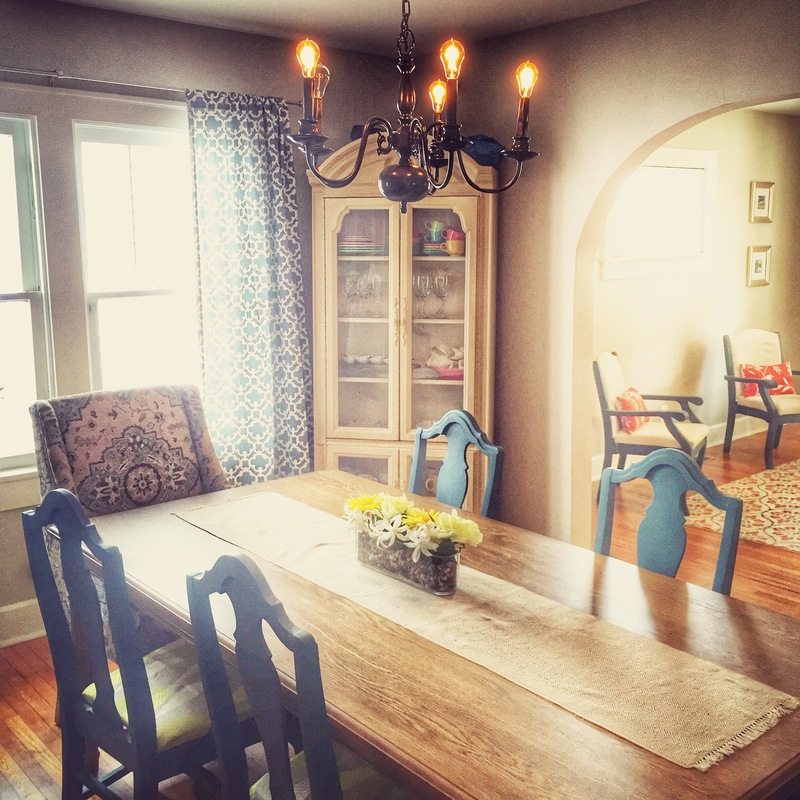 Finishing – Stain the wood or paint it. If you choose to stain, keep in mind that sanding softens the wood and will cause it to soak up a lot of stain. Due to the rough wood, you will need to work the stain into the cracks and crevices with a cloth or brush. Hanging the rack – Mount it directly into your wall studs to support the weight of the bottles and glasses. Add felt bumper pads to the backside to keep it from scuffing your wall if bumped. Repurposing old wood from pallets helps keep them out of our landfills and saves you money. They add rustic charm to the home and garden. Stop wishing for new patio furniture or flower containers and start building what you need with wooden pallets. There are so many DIY projects to use these wooden wonders on – your Winter to-do list may stretch into Spring. From circular saws and drills to jigsaws and orbital sanders, our expert staff is always on hand to help with your next DIY home project. Still wondering what you can do with the wooden pallets around your house? Check out our previous blog, Summer Garden Update 2 – Garden Boxes Add Pizzazz to Planting, to help get those creative DIY juices flowing. As always, if you have any questions about pricing or how-to’s, don’t hesitate to contact us. Stop by our store — we’re open seven days a week.